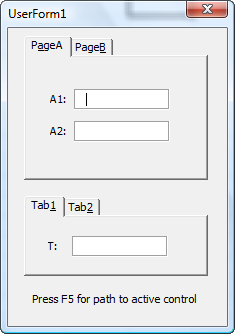 In the attached workbook you find UserForm1 with MultiPage1 with two pages, TabStrip1 with two tabs, and some textboxes and labels. points to MultiPage1, and not to TextBoxA1. Both properties point to TextBoxA1 after startup. This will point to TextBoxB1, TextBoxB2 or Nothing. sPath = sPath & " - Nothing"
After startup click on the tab of PageA, then click on the tab of PageB (which now has the focus) and press F5. After 2. click on TextBoxB2 and press F5. After startup click twice (!) on Tab2 and press F5. After startup click on textbox T and press F5. Note that this textbox is contained in the userform and not in the tabstrip. Disable all controls on the userform, restart and press F5. The container objects UserForm, Frame and Page all have an ActiveControl property. MultiPage and TabStrip however, are not containers but basically collections, of which one item is selected: SelectedItem. This explains why we have to treat these objects differently in the above code. After startup click on tab PageA. Notice that the textbox lost the focus, the tab got the focus. However, after pressing F5 we see that TextBoxA1 still is the active object. Conclusion: the active object is not necessarily the control having the focus. Path example 2 above shows that initially the ActiveControl property of a Page is Nothing. This property is set after the first visit of the page, and will remain so. For example: after startup click on tab PageB. 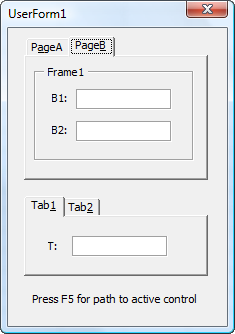 Now the property UserForm1.MultiPage1.PageA.ActiveControl is still valid, and points to TextBoxA1. After startup, if the user clicks tab PageA the focus moves to the tab. Unfortunately, at this point no Exit or Enter event is fired. This makes it virtually impossible to determine if a native control has the focus. Thanks for your comment and sharing your great idea. This works fine for text and comboboxes, as you say. Unfortunately other controls don’t have a CurX property. Found this code and it fits into this article like a hand in a glove. I have found this to be extremely useful.